What is a PROBLEM in a research project? This is the craziest presentation we’ve ever made! (You will see why). In this presentation, we explain what is a PROBLEM in a research project. The inspiration for this presentation comes from the resistance many people have to the word PROBLEM, without fully understanding its meaning in academic research. We situate problems in research projects, that is, within specific logics of enquiry and theoretical frameworks that lead to specific research questions and methodologies. It is important that you describe the PROBLEM at the outset of your research project or presentation. You need to indicate to the audience what are the issues you want to tackle, or what is it you want to KNOW! It is also important that you clarify WHY THIS PROBLEM IS RELEVANT. Why is it worth your (and everybody else’s) attention. The ultimate presentation on presentation design: Steal this presentation! Slide presentations are a trap! Nothing replaces a good old story told simply to an interested audience. Story telling is an art. Slide presentations (the ones we’ve come to know erroneously as “PowerPoint presentations”) may rob us of our story telling capabilities if we concentrate on the slides too much: doing so makes our stories flat and make us pay more attention to the slides than to communicating with the audience. Remember: it is all about the STORY you tell the audience. Powerpoint is just a tool among many to tell a good story: you could try making posters, models, films, songs and even a short theatre play would do the trick (we call them “role playing” games in Urbanism). 1. Remember: it is all about the STORY you are telling the audience. Make sure they understand the issue you are tackling and make them interested.You must tell them what the PROBLEM or ISSUE is and why it is relevant. IN this way, they will be abe to share your concerns and think WITH you. It helps when you know why your theme is relevant yourself. 2. If you are telling a story, FACE THE AUDIENCE. Never, never, never (never, I said), face the screen of your own computer or WORSE, give your back to the audience and face the screen on the wall. If you do that, a magical alarm will sound and the floor will open under your feet and you will fall through. God knows where you will end up. Kidding. Face the audience. Read their faces and COMMUNICATE. 3. Stand up. There is nothing more off-putting than seating presenters. 4. Greet the audience and introduce yourself before starting a presentation. It is polite and if you do that, it is clear that you are beginning your story and the audience will focus on YOU. 5. Assume a professional, relaxed attitude. It is just a presentation and you will probably make thousands of them in the course of your career. Better relax. 6. Enjoy and entice. If you are not enthusiastic about your own work, why should the audience be? If you are enthusiastic about your own work, you will probably pass your enthusiasm on! 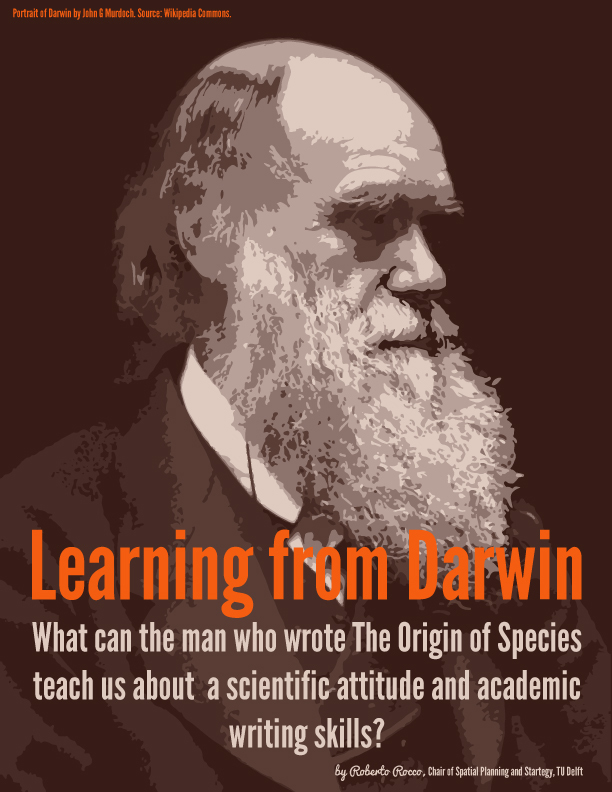 Learning from Darwin: What can the man who wrote The Origin of Species teach us about a scientific attitude and academic writing skills? ‘On the Origin of Species’ was published on 24 November 1859. It is a work of scientific literature by Charles Darwin, and it is considered the foundation of evolutionary biology. In this text, we comment the INTRODUCTION to The Origin of Species and highlight aspects of the text that are relevant for us to understand a scientific attitude and how to translate this attitude into text. This exercise is intended to Urbanism students who are unsure about the tone and the kind of language they must adopt in scientific reports. It also highlights important elements of a research project. The text we are about to analyse was written in the second half of the 19th century, but it is still incredibly modern and actual. Read the text carefully and reflect on the comments. What can you incorporate into your essays and reports? AR2U090 Methodology Learning from DARWIN 3. CLICK to download. What if we could evaluate projects, plans and designs using an enhanced concept of sustainability? “For sustainability to occur, it must occur simultaneously in each of its three dimensions” (economic, social and environmental) Larsen, 2012. These three crucial and necessary dimensions of sustainability are, each of them, connected to big traditions of study and analysis that must be integrated. My claim here is that this enhanced concept of sustainability help us derive solid criteria to evaluate plans, projects and designs in Urbanism, and to connect this evaluation to larger academic traditions. Cover of the Book “Good Cities, Better Lives” by Peter Hall. Congratulations to Peter Hall, whose book Good Cities, Better Lives was just named a Times Higher Education Book of 2013! 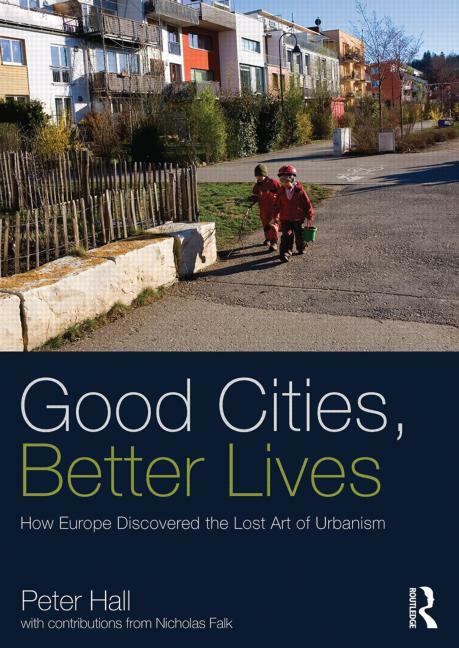 “Peter Hall’s Good Cities, Better Lives: How Europe Discovered the Lost Art of Urbanism (Routledge) is already the book everyone is talking about as we see our cities’ planning departments decimated around us. It is a beacon of what is possible and gives hope.” – Flora Samuel, Professor in the School of Architecture, University of Sheffield, Times Higher Education. This book has one central theme: how, in the United Kingdom, can we create better cities and towns in which to live and work and play? What can we learn from other countries, especially our near neighbours in Europe? And, in turn, can we provide lessons for other countries facing similar dilemmas? Urban Britain is not functioning as it should. Social inequalities and regional disparities show little sign of going away. Efforts to generate growth, and spread it to the poorer areas of cities, have failed dismally. Much new urban development and redevelopment is not up to standard. Yet there are cities in mainland Europe, which have set new standards of high-quality sustainable urban development. This book looks at these best-practice examples – in Germany, the Netherlands, France and Scandinavia, – and suggests ways in which the UK and other countries could do the same. The book is in three parts. Part 1 analyses the main issues for urban planning and development – in economic development and job generation, sustainable development, housing policy, transport and development mechanisms – and probes how practice in the UK has fallen short. Part Two embarks on a tour of best-practice cities in Europe, starting in Germany with the country’s boosting of its cities’ economies, moving to the spectacularly successful new housing developments in the Netherlands, from there to France’s integrated city transport, then to Scandinavia’s pursuit of sustainability for its cities, and finally back to Germany, to Freiburg – the city that ‘did it all’. Part Three sums up the lessons of Part Two and sets out the key steps needed to launch a new wave of urban development and regeneration on a radically different basis.